As a parent to a newborn child, we are certain that you are always on a lookout for the best of everything that your bundle of joy deserves. This goes with products too. No matter whatever the products you have got to choose, one thing you will surely encounter is the variety of one single product available. At times like these, it gets really tough to choose the best. Take baby cribs for instance; a baby crib is a must have for a newborn child. So, if you are looking to get a baby crib, we are going to make your work easier for you by reviewing five of the best baby cribs available in the market right now. Before we even get to reviewing the best baby cribs, let us tell you first why do you actually need a crib for your baby. As recommended by The American Academy of Pediatrics, your child should be in the same room as you for the first six months. A crib is essential to provide the baby with a safe space for themselves, especially when they are asleep so that they do not roll over and fall. A crib keeps a child safe from any harm. Now, cribs can indeed be pricey. However, this is not the place where you would want to cut cost as your child’s safety is in question. Cribs can cost you anywhere between a hundred dollars to a good couple of thousands. With that said, amongst the plethora of child’s cribs that are available today, which one is actually the best? Well, that is the question we will be answering you in this article. We are going to be speaking about five of the very best baby cribs in detail. These cribs are not only extremely safe but also packed with great features. Most importantly, we will list you those only that will not cause a big hole in your pocket. The Dream On Me Violet 7 in 1 Convertible Life Style Crib is perfect for those who are looking to stick to one crib for a very long time. As the title of this products states, this crib has seven different options that it can be converted into. This bed will last your child from their toddler days to their youth. The seven convertible features include a crib, a toddler bed, a day bed, a youth bed I & II and a full-sized bed I & II. For those who are extremely critical of color schemes, this crib is available in six colors to match absolutely any room. The six colors this crib is available in are Royal Blue, Cherry, Espresso, Natural, White, and Black. This crib is very aesthetically pleasing and is also sturdy as it is constructed from New Zealand Pinewood. This product Weighs at about 44 lbs. and its dimensions in inches are 58 x 29 x 39. To catch up with your baby’s growth and to minimize the danger of your child falling out, this crib allows four position mattress support. This will help accommodate the child’s needs as well as yours. Keeping safety in mind, this crib is tested and has passed all the safety regulations set by the government and the ASTM. It is free of all lead, latex and toxic materials. The mattress, the guardrail, bed frame, stabilizer and full-size rail are all sold separately. The variety of colors available for this crib automatically gives itself a plus point. Even though this product is made from sturdy pinewood, it is not so heavy that gives you a body pain to move around, but not so light either to be unsafe for your child. Multi-functional crib, easily adapts to your child needs. An issue you may end up facing is that this product will come with no instruction manual. You will have to end up figuring out how to assemble this product yourself or get help by paying extra. There are also a couple of missing tools in order to assemble this product. The Delta Children Emery 4-in-1 Crib is a brilliant multi-functional crib. It effortlessly converts from a crib to a toddler bed, then to a daybed and ultimately to a full-sized bed. It adapts perfectly to your child’s growth. Delta Children is a well-known brand for child care and has been in the game for a while now. The wood construction on this crib is simply fantastic. It is built from a strong and sturdy wood. It is also easy to assemble. After assembly, this product has dimensions of 55.75 x 30.25 x 44 inches. It also has three mattress height options, which you can lower as your child grows. You can rest safely knowing that your child is in a crib that is extremely safe, as this crib is certified by JPMA. The JPMA certification is a certification seal on a product that assures the consumer that the product has been tested to the highest standard in its category, which is established by the ASTM and CPSC. This crib is free from all kinds of lead and toxic material. And if you are concerned whether it will match your furniture or not, then that will not be a concern. This crib comes in two very versatile colors, White and Dark Chocolate. This product has a daybed rail included, but the crib conversion rail as well as the toddler guard rail is not included and needs to be purchased separately. It fits a standard sized mattress which is also sold separately. One of the biggest pros of the product is the fact that it is JPMA certified, ensuring that it is always going to be safe for the child. This product gets another plus point for its ease of assembly and choices of two versatile colors. The railings on this crib are a little too far apart from each other. This can become an issue for your child as he or she may have his hands or legs get stuck between the railings, leaving them bruised. The paint on this crib tends to wear off quicker than you would anticipate. Comes in only two colors. Union may be a fairly new brand in the market. However, this brand and their cribs have gained quite a popularity on the online market among parents. The Union 3 in 1 Convertible Crib is perfect for those who are seeking a very minimalistic, yet modern design. Due to its very simple and sleek aesthetics, it makes it very versatile. This makes it really appealing to prospective buyers. Speaking about the features about this crib, it can be used right from birth to all the way to teenage. The crib converts into a toddler bed and then into a full-sized bed. The conversion kits to make it into a toddler bed and a full-sized bed are sold separately. The crib gives you the flexibility to adjust the mattress in four different positions. Which makes it easy to crank it up to the highest to reach your child. The mattress is sold separately as well. The Union 3 in 1 Convertible Crib comes in four colors, which are espresso, gray, sunshine, and white. The choices of colors available will help complement other furniture in the room. The crib comes in one standard size which is 53.5 x 30.5 x 33.5 inches. This crib is certified by the JPMA and meets all the safety standards set by the ASTM and CPSC. It is very easy to assemble this crib. You will not need any additional help. It can take you as less as 30 minutes to fully assemble it. The minimalist look is something that catches the attention of a lot of parents. The paint may wear off as you assemble the product. If you are looking for a crib without any hassle, then the Graco Benton Convertible Crib is just the right one for you. This product can transition brilliantly from a crib to a toddler bed to a daybed and ultimately to a full-sized bed. It has a standard crib size; its dimensions are 56.7 x 29.8 x 42 inches and weighs about 41 lbs. To match the room’s surroundings, the Graco Benton crib is available in three colors which are Espresso, White, and Pebble Gray. As an added advantage, there are about 6.5 inches of storage space underneath the crib. The bed has three different position settings that can be changed as per your needs and preferences. As it goes with every Graco Benton products, this crib has high safety standards as well. This Graco Benton Convertible Crib is JMPA certified, and it meets or even exceeds all the safety standards set by the ASTM and CPSC. This crib is free from all non-toxic and lead products. The bed frame, toddler bed conversion kit, full-sized bed conversion kit as well as the mattress are all sold separately. The wood that is used in this crib is highly durable and extremely sturdy. Although sturdy, it is also lightweight. It is free from all forms of toxic and harmful substances. It will remain sturdy no matter how many times you disassemble and reassemble it. There is a possibility that the instruction manual that comes along with this crib will actually be for another Graco Benton product, Certain parts of the crib could arrive broken, so it’s best to contact customer service right away for a replacement. There can also be an issue that the bed springs may not line up with the holes. For parents under five feet, accessing your child from this crib will turn out to be a task. The Storkcraft Rosland Crib is made out of a strong, sturdy and very high-quality pinewood. So, this crib is expected to last you a really long time. As mentioned in the title, this is a 3 in 1 crib, that is it can get converted into a toddler bed and into a daybed. Add-ons are to be purchased separately. The mattress can be adjusted to three levels to help accommodate your child’s growth. However, the mattress is sold separately too. The Storkcraft Rosland crib has a very simple, elegant and minimalistic design. Even though it is simple, it yet has a modern touch to it. One thing that will come to your notice right away is that this crib does not have a headboard. This means that this crib can be used by your child comfortably until about three to four years. This crib is JPMA certified as well. It meets and also exceeds all of the safety standards set by the ASTM and CPSC. And these come in three colors which are espresso, gray, and white. This crib weighs about 42 lbs. and its dimensions are 55 x 30.5 x 34 inches. This takes hardly any time to assemble and is also really simple to understand. The wood used for this crib is very high-quality and can last for a very long time. It transitions effortlessly from a toddler bed to a daybed and keeps a small child safe in its crib. Parents simply adore the cribs minimalistic design. The screws on this crib will keep coming out over time, which as a user you will have to keep screwing back in constantly. Certain parts of this crib may be missing when you get this package. In conclusion, we hope our detailed article for the best baby cribs has helped you in making your decision easier. All of these products are amongst the best ones in their category, and you will certainly not get any better than these. However, if we had to make a choice between these five, we would have to choose the Dream On Me Violet 7 in 1 Convertible Life Style Crib. 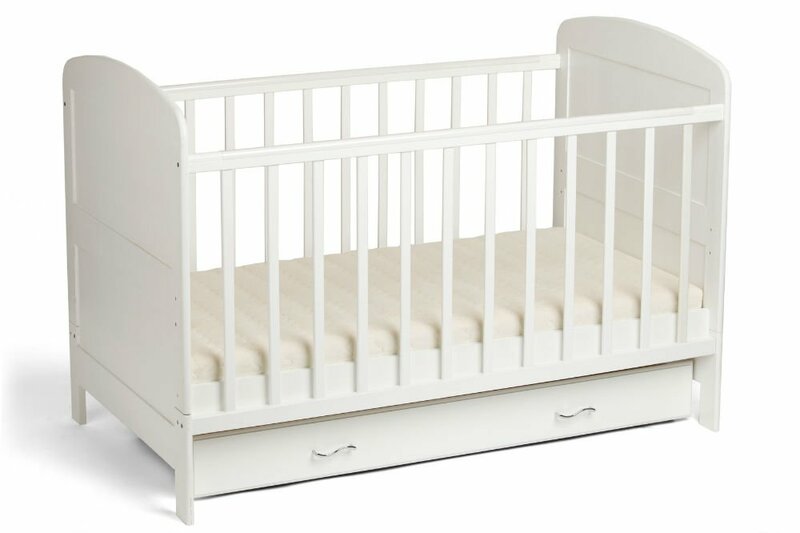 It has 6 different colors that you can pick from, made from sturdy but yet pretty light wood easy to move around yet safe enough for the baby, has a lot of different functions based on your needs, also its price is great for all the value that it has to offer, this one crib will last your child for a very long time! Given its features and all of its pros, its cons can be overlooked. This is the most pocket-friendly as well as feature-packed cribs amongst all.